This is the third movement of French composer Jacques-Christophe Naudot's Suite en trio “Les plaisirs de Champigny”, Op. 18. The term “musette” designates both a traditional style of French popular music and a baroque-era instrument similar to a bagpipe. 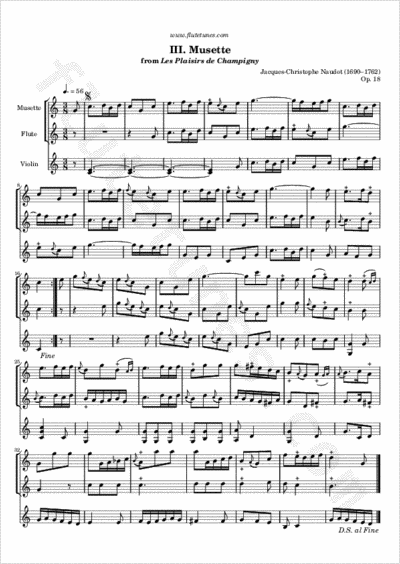 This particular musette (music style) was written for musette (instrument), flute, and violin, but it can be played as is by two flutes and a violin, or with very little modification by three modern flutes.